Most analysis methods of PET data require calculation of integral over time (“area-under-curve”) of the input function, for instance in FUR and Patlak plot; in other cases, including compartmental models the integration of plasma or blood curve is less obvious but still done by the analysis tools. Integration of dynamic PET data is needed in Logan plot, SUV, and SUVR calculations. In addition, AUC from time zero to infinity needs to be estimated in dosimetry and pharmacokinetics. Figure 1. 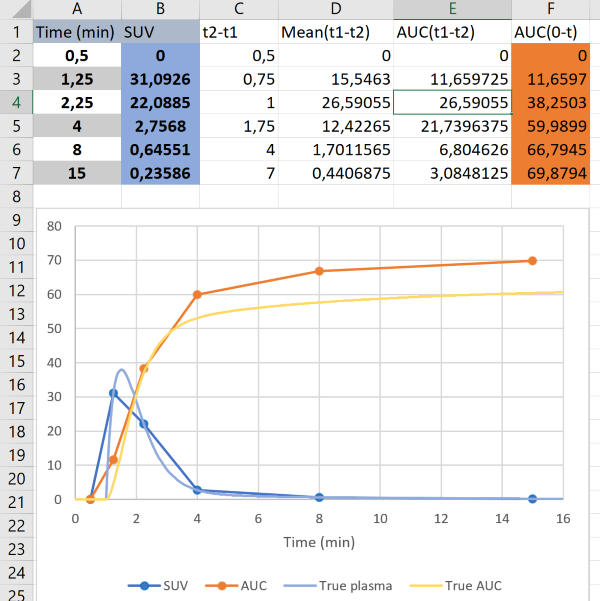 AUC calculation: Blood samples are collected at discrete time points (column A) and sample radioactivity concentrations are listed in SUV units (column B). 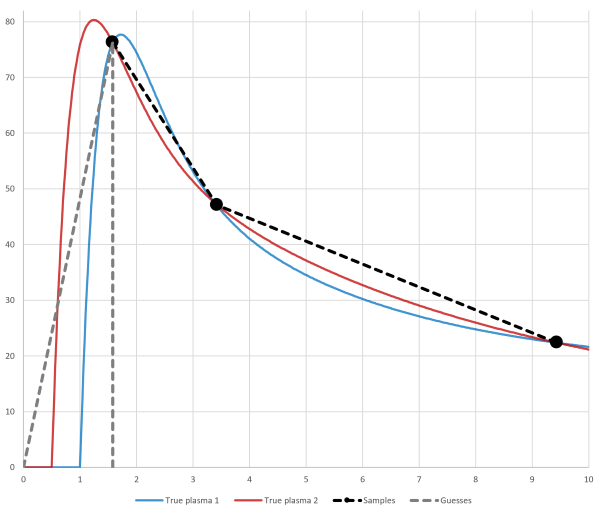 Concentration curve is plotted in blue. 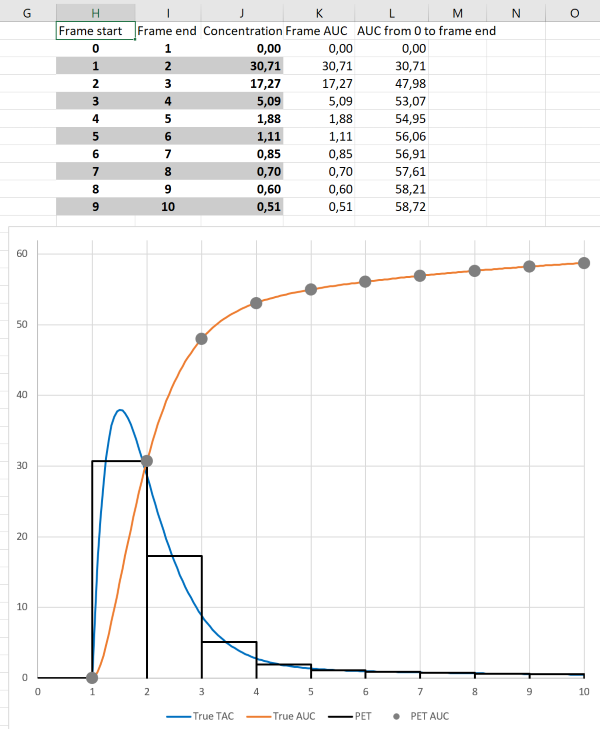 AUC is calculated stepwise between each sample time (column E), by multiplying the sample time difference (column C) and the mean of sample concentrations (column D). AUCs are then summed (column F). The sum of AUC from time zero to each sample point is plotted in orange colour. The unit of AUC is (time unit)×(concentration unit). Analysis software calculates the integrals similarly. Integrals can also be computed using command-line program interpol with option -i. Figure 2. Effect of sparse sampling on AUC calculation: Light blue curve represents the true plasma curve, and yellow line represents the true AUC. Since the sampling is too sparse, the true shape of the plasma curve was missed, in this example leading to overestimation of AUC between the two first samples, underestimation of AUC between the next samples, and again overestimation between the 3rd and 4th samples. By definition, also the errors are summed in AUC calculation, leading to overestimated (in this example) AUC for the whole time time range. Figure 3. Effect of missing the TAC peak: In this example the black circles represent the measured plasma concentrations. True plasma TAC could be either the blue or red curve. Since the blood sampling has missed the part where concentration is still zero or increasing, we have no means to guess whether the curve peak was before or after the first measured sample. The initial part of AUC must be estimated using either of the methods depicted with the grey dashed lines. Both methods will lead to error, and the magnitude and direction of the error is unknown and dependent on the true plasma curve. With the command-line program interpol user can optionally select the method how to estimate the initial AUC. Program inpstart can be used in scripts to roughly check that the peak of input curve was not missed, but it must not be used to replace visual verification of the data quality. One solution is to measure blood TAC using automatic blood sampling system (ABSS), although it has its own problems. In theory, fitting a mathematical function to the sparse input data may help in integration and interpolation; but since the measured data is noisy, and functions are only empirical representations of typical tracer kinetics after successful tracer administration, fitting would just increase uncertainty in the analysis process. In pharmacokinetic studies and and in measurement of GFR, blood sampling usually starts few minutes after the bolus injection, but calculation of clearance requires that AUC0-∞ is measured. The initial part has often been estimated with back-extrapolation, which may lead to “mixing” or “bolus” error. Tissue time-activity curves (TTACs) and image derived input curves, based on PET measurements, and blood time-activity curves (BTACs) collected using ABSS are collected as mean concentrations during specified time frames. The events (counts) have to be collected over the certain time “frame” to achieve acceptable count statistics, and the number of measured events are then divided by the time frame length to obtain the count rates (counts/s), which are further calibrated to radioactivity concentrations (Bq/mL) based on the measured volume and calibration coefficients. If time frames are sufficiently short, we can assume that the average tracer concentration during the time frame represents the instantaneous concentration at frame middle time point (“midframe approximation”, see Buchert et al., 2003). If concentration changes markedly during the time frame, then the midframe approximation is not valid (Figs 4a and 4b). To obtain AUC during the time frame, the radioactivity concentration can be simply multiplied by the frame length, and the AUC obtained this way is not biased at the frame end times even with long the frame lengths (Figs 4a and 4b), except for the small error introduced by decay correction which assumes that concentration does not change during the frame. If integral needs to be assessed between the frame start and end times, then some assumptions must be made about the concentration changes during the time frame. Figure 4a. 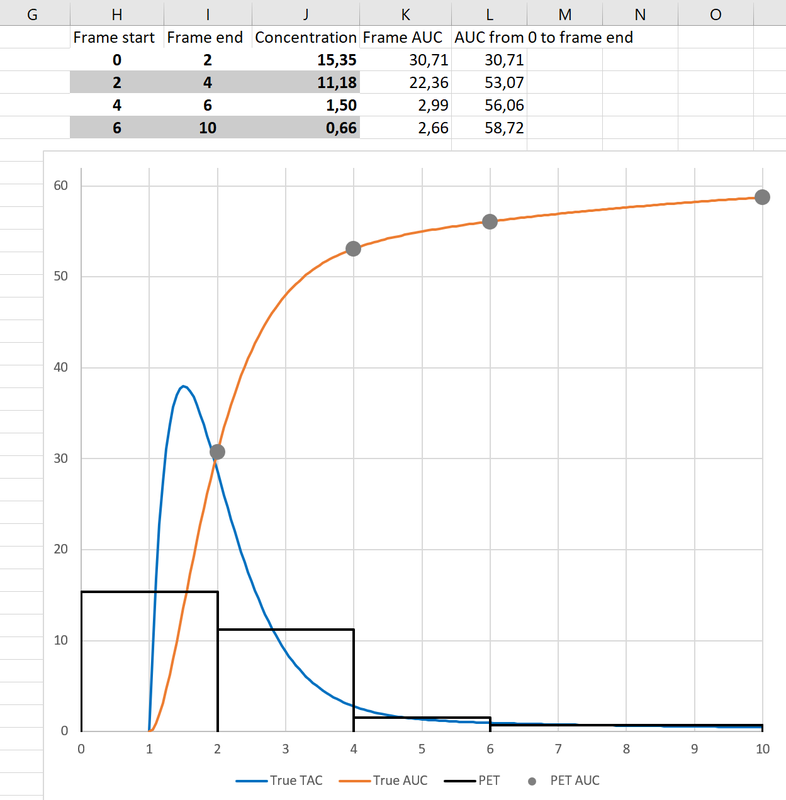 AUC from time frame data: Blue line represents the true time-activity curve, and orange line its AUC from time zero. Black bars represent the PET frames. For each time frame, AUC (column K) can be calculated as concentration average during the frame (column J) multiplied by frame duration (column I minus column H). AUC from time zero to the end of PET frame (column L, grey circles) can be calculated as sum of AUCs for individual frames. Figure 4b. 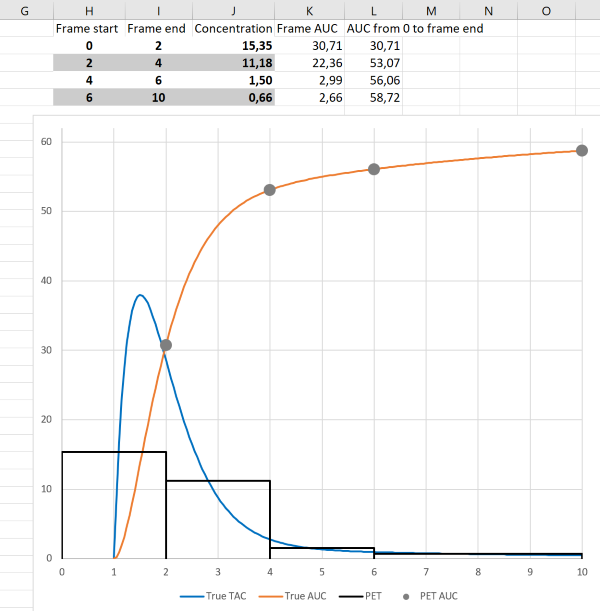 AUC from time frame data: In this example the same data is used as in previous figure, except that frame lengths are now longer. As can be seen, AUC can still be calculated correctly, but TAC shape is very poorly represented by the frame averages. The fact that AUC can be correctly calculated from PET data with long frames can be utilized in PET scan protocols for Patlak and Logan plots; only AUC is needed from the early time range for these graphical analysis methods, and therefore the first image time frames can be long. Analysis software calculates the integrals based on image time frames, and also regional TTACs may preserve frame start and end times. Integrals, considering the frames lengths, can also be computed using command-line programs dftinteg and imginteg. , which is then added to the AUC calculated from the sampled time range. If you are allergic to command line, you can write the above command in to text file, and save it with extension .bat (in Windows), and then double-click the .bat file icon. Figure 5a. 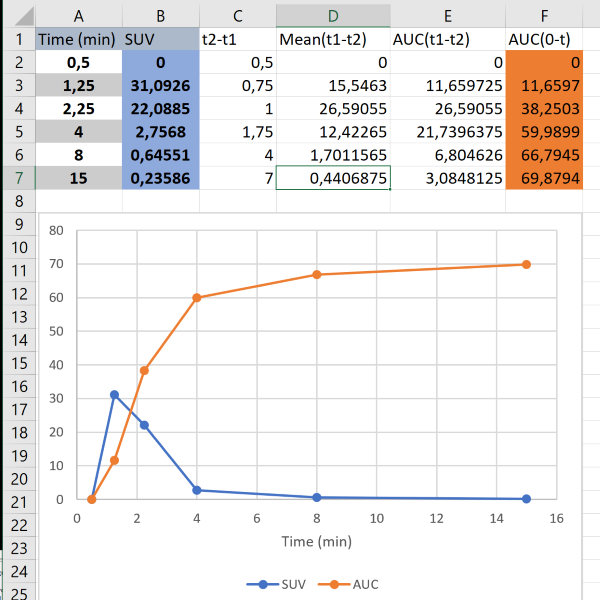 AUC from time zero to infinity estimated using paucinf, saved in HTML table format, and drag-and-dropped into Excel. “Start”-column gives the sample time from which the linear fit was started. Figure 5b. Line fits to the ln-transformed data, as saved in SVG format. Depending on the kinetics and concentration units, ln-transformed data can be negative, when measured values are <1.0; this does not affect the calculation, but measured values ≤0.0 would lead to an error. By default, paucinf determines automatically the best time range for the linear fitting. The time range can be optionally refined. This approach only works with curves approaching zero, which is the case in dosimetry calculations, because the activity data is not corrected for physical decay. In pharmacokinetic calculations decay corrected activity concentrations are used; although concentrations eventually would approach zero, during the time scope of PET scans the concentrations often reach an apparently steady level well above zero; extrapolation with line fitting to ln-transformed curves does not work in that case, but at least two-exponential function is required, and extrapolation and especially AUC calculation will be prone to large errors. Chen K, Huang S-C, Feng D. New estimation methods that directly use the time accumulated counts in the input function in quantitative dynamic PET studies. Phys Med Biol. 1994; 39: 2073-2090. doi: 10.1088/0031-9155/39/11/017. Zhang Y, Huo M, Zhou J, Xie S. PKSolver: An add-in program for pharmacokinetic and pharmacodynamic data analysis in Microsoft Excel. Comput Methods Programs Biomed. 2010; 99: 306-314. doi: 10.1016/j.cmpb.2010.01.007.